Heartless resembling a monkey. Unlike Powerwilds, they attack from long range with a sling shot. They scamper about during battle, making them difficult to hit. It teases its enemies and throws banana peels from far away. Be careful not to slip! Attract fallen cards and items for easy retrieval. The Bouncywild is an Emblem Heartless that appears in Kingdom Hearts and Kingdom Hearts Chain of Memories. 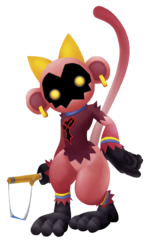 The monkey-like Bouncywild is also one of the rare enemies in the Kingdom Hearts series to boast a distinctly feminine form. They have soft brown fur, over which they wear a darker brown shirt with jagged edges and the Heartless Emblem. Bouncywilds also wear a gold choker and hoop earrings, a bright red bow on top of their head, and blue, yellow, and green bracelets and anklets. Their paws are a dark, velvety-brown, and they also have a tail almost as long as they are tall. In spite of their initially cute appearance, the Bouncywild is still a dangerous Heartless, as signified by its shadowed face, yellow eyes, and toothed edges where the face meets the fur. In Kingdom Hearts Final Mix, Bouncywilds feature an even more feminine color scheme; the fur is now in shades of pink, the bow a bright sunny yellow, the choker dark blue, and the paws black. The former part of the Bouncywild's name highlights its quick, jumpy movements and attacks. Other Heartless of its family share the latter part of the name, signifying that they are of the same species. 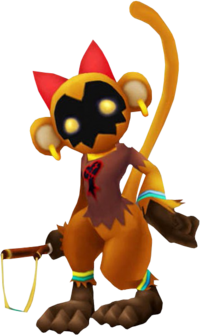 It could also be referring to the Heartless's wild, monkey-like appearance. Their main attack consists of shooting with their slingshot from a relative long distance, as a support to the close-combat Powerwilds with whom they are often paired. If Sora gets too close to one, it will run away while throwing banana peels on the floor. Should Sora step on one of them, he'll slip and drop a large amount of munny. If one is not cautious, a Bouncywild may charge a sphere of energy and fire it from afar. Send the energy sphere flying back towards the Bouncywild with Guard. Defeating Bouncywild grants Sora relatively little EXP, but it drops a large amount of munny, especially if it slips on a banana peel. The Bouncywild is known for its high speed and its attacks built around its slingshot. In addition to firing a sphere of energy from a distance, it can also throw a banana peel that party members can trip on, causing them to lose munny. Additionally, the Bouncywild can call forth two Powerwilds, though on rare occasions. Afterwards, it will eventually disappear from battle on its own if given the chance, quickly ending the battle. The Bouncywild was made a far less difficult opponent in this game. It will still fire orbs at Sora, but it isn't very hard to defeat. Boucywilds often wander around, and sometimes can surround him in a swarm, yet they are easy to take down with magic cards. The Bouncywild is the same as its Kingdom Hearts Chain of Memories incarnation, except the Bouncywild's banana attack has been added. Sora will lose Moogle Points instead of munny. This page was last edited on 18 April 2019, at 17:55.